The bottles I contributed are shown above, ranging from sweet/sherry/vanilla on the left to smoky and peaty on the right. Sue brought her own box of goodies, and so we spent a pleasant evening sipping this and that. 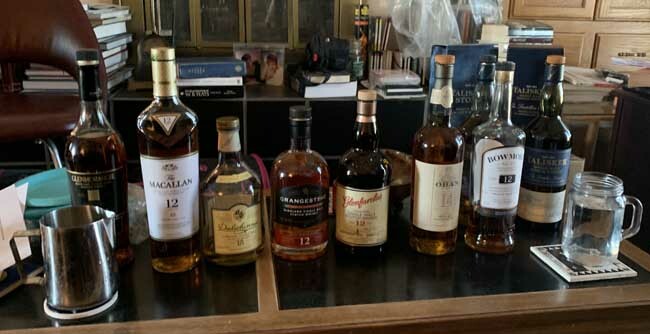 The problem with spending an evening sipping a dozen or more scotches is that it’s difficult to remember afterwards what you liked and didn’t, but I can remember a few surprises. The Dalwhinnie 15-year-old tasted better in company with other scotches than it did by itself. A very pleasant discovery was the Glengoyne 18-year, a very fine Highland with a notable absence of peat. (Those of you who hate peat might want to give it a try.) The Glen Scotia 15-year was delightful. Glen Scotia is one of three Campbelltown distilleries left in what was once the largest scotch-producing region of Scotland, and its distinctive and attractive taste made me wonder why all those other distilleries closed. I also liked the Tomatin 18, but damned if I can remember why. I don’t have a problem with hangovers, usually, at least not when I’m drinking the good stuff. But for those of you who do, Caro Emerald has been there. A couple months ago the grumpy guy who works at the liquor store suggested I try Aberlour A’bunadh — it wasn’t something I was familiar with, but it was fantastic. No Caol Ila? It’s like Laphroaig-lite with a touch of iodine.